ItemBARK_1994.0963.0022 - Group of unidentified Chinese men in suits with Borg Ching Mah, Chinese school teacher, at lower right. Many wear ribbons on their lapels. Possibly taken in Nanaimo; circa 1930. Item BARK_1994.0963.0022 - Group of unidentified Chinese men in suits with Borg Ching Mah, Chinese school teacher, at lower right. Many wear ribbons on their lapels. Possibly taken in Nanaimo; circa 1930. A group of Chinese men are sitting on a manicured lawn in what appears to be the garden area of a home. The clothing they are wearing suggests a formal meeting. Some are wearing ribbons attached to their lapels. (see also P6396) Borg/Bong(?) 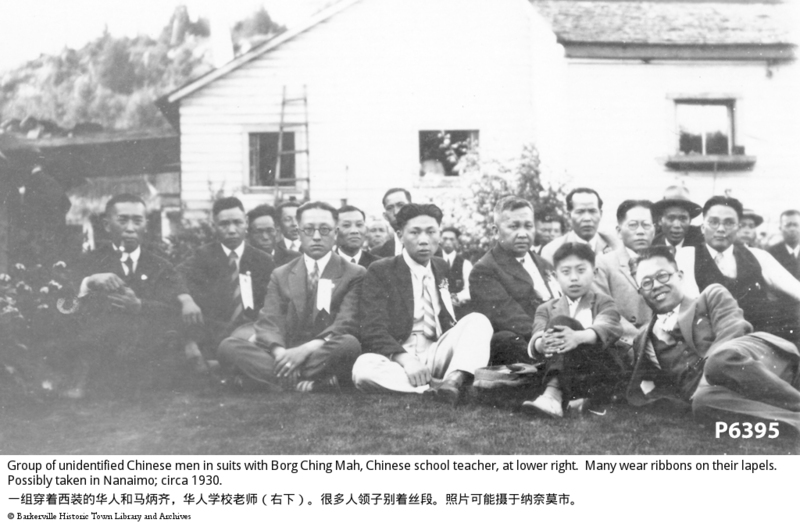 Ching Mah, Chinese School teacher at bottom right.